The use of GFRC mixes has opened up a plethora of new design possibilities for contractors who make concrete countertops, fireplace surrounds, wall panels, furniture, and other decorative elements. Because GFRC is significantly lighter in weight and higher in tensile strength than conventional concrete, countertop slabs can be made without seams and span greater lengths. 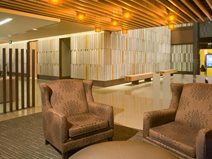 GFRC can be cast using decorative form liners to create architectural wall panels as thin and light as standard wood paneling while permitting more flexibility in shape, color, and texture. 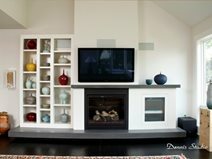 GFRC fireplace surrounds can span from floor to ceiling without requiring special reinforcement, and hearths and mantles can extend from wall to wall or be cantilevered to appear as if floating on air. GFRC can even be used outdoors to make artificial rock formations, permitting the creation of dramatic rock and waterscapes without the need to haul in heavy boulders. What’s more, GFRC offers the same decorative versatility as conventional concrete. It can be formed into nearly any shape and stained or integrally colored. Various tints of gray, white, and buff can be achieved by using colored cements or pigments. The surface finish can be lightly textured or polished smooth to expose the aggregate. And GFRC can be seeded with colored decorative glass or stone to create granite-like effects. In keeping with this home’s contemporary, minimalist look, the architect and homeowners chose to make all the countertops pure white. The contractor achieved this look by using a custom GFRC mix made with a titanium white pigment, along with white portland cement and white sand. 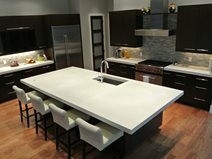 Reinforced with a blend of ½- and ¾-inch alkali-resistant glass fibers, the GFRC helped reduce the weight of the countertops without affecting their durability. Initially the architect for Amazon.com's building in downtown Seattle wanted to use standard reinforced concrete wall panels to represent rows and rows of books, but the weight would have been a problem. Steve Silberman of Absolute ConcreteWorks advised him that glass-fiber-reinforced concrete would be the best way to go. Once fabricated the panels were at least 25% lighter, making them easier to maneuver and faster to install. This stately table measures 11-feet long by 4-feet wide. Because of the size it was cast in three pieces using a lightweight glass-fiber-reinforced concrete mix. The pieces were then joined together with stainless steel bands. If a traditional concrete mix had been used this table would have been far too heavy to be practical. 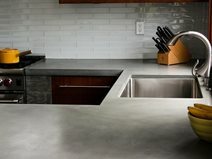 Completely seamless, this expansive 11- by 5 ½-foot concrete kitchen island was cast in one piece. The use of a lightweight GFRC mix kept the weight at 750 pounds. To achieve the brilliant white coloration of the concrete, a titanium white pigment and white silica sand was used instead of natural sand to obtain greater purity. Once the island was removed from the mold, it was lightly ground to lightly expose the white silica sand. 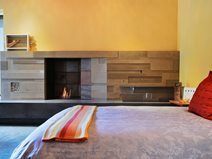 Both bedrooms in this spectacular townhouse in the scenic mountains of Sun Valley, Ida., have fireplace surrounds precast using integrally colored GFRC. A proprietary decorative fiber-reinforced concrete mix was used that requires no blending and can be applied thinly. 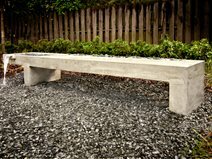 This Zen-style bench was cast in one piece using a lightweight glass-fiber-reinforced concrete in a blend of gray and white. This would not have been possible with a traditional concrete mix. 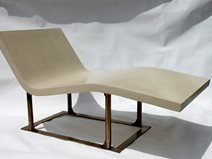 This bench has the best of both worlds because it is lightweight and durable. It will weather well outdoors for many years. A lightweight GFRC mix made it possible to cast this large 34-square-foot concrete island without seams. Using GFRC instead of traditional wet-cast concrete reduced the weight of the island from 950 pounds to only 450 pounds, allowing it to be carried up a flight of stairs. The countertop color, Bleeker Beige, was replicated from a Benjamin Moore paint color chart. This stunning kitchen features GFRC countertops that were simply sealed to enhance the natural gray color. 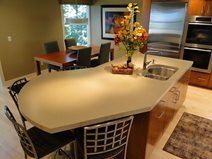 Contractor Brock Greenberg of Concrete Wave Design says that they use GFRC for most of their countertop projects and have developed their own GFRC mix, which incorporates polymer, sand cement, fibers, and a plasticizer. "With different techniques, we can get GFRC to pretty much look like any kind of concrete you would want," he says. 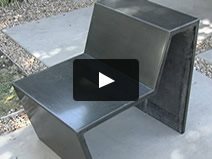 Watch 25 videos explaining how to design and build Fu-Tung Cheng’s line of concrete furniture using CHENG D-FRC Casting Mix, a Portland-cement-based mix with a matrix of glass and other fine fibers.